The inevitable finally came for Franklin Perez, but he left a lasting impression with a strong final outing in big league camp. Detroit's No. 3 prospect tossed two hitless frames for the Major League squad in a scrimmage against Minor Leaguers earlier Monday. He was reassigned to Minor League camp along with 12 other prospects following the game. Perez is expected to begin the season with Class A Advanced Lakeland. Obtained from the Astros in the Justin Verlander deal in 2017, Perez dealt with a pair of long-term injuries last year which short-circuited what was expected to be a big season. MLB.com's No. 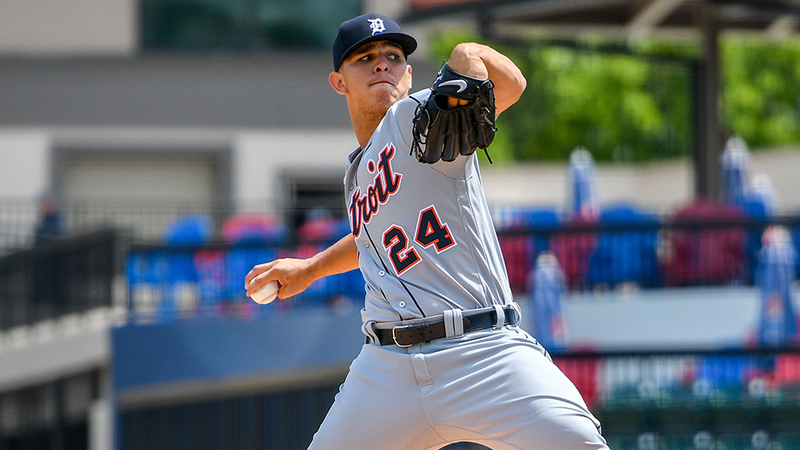 78 overall prospect did not make his Tigers debut until June 25, when he took the mound for the first of three rehab starts in the Rookie-level Gulf Coast League. He moved on to the Florida State League and was winless in four more starts while posting a 7.94 ERA before shoulder inflammation cost him the rest of the season. Perez joined Detroit in the deal that also netted the club No. 5 prospect Daz Cameron and No. 13 Jake Rogers. The right-hander was coming off a 2017 season in which he went 6-3 with a 3.02 ERA and a 1.14 WHIP in 19 appearances -- including 16 starts -- between Class A Advanced Buies Creek and Double-A Corpus Christi. The 21-year-old tossed a scoreless inning in his one official Grapefruit League appearance. Cameron and Rogers were reassigned Monday, as well as Tigers No. 4 prospect Isaac Paredes, No. 7 Willi Castro, No. 9 Parker Meadows, No. 12 Wenceel Perez, No. 14 Kody Clemens, No. 17 Jacob Robson, No. 22 Daniel Woodrow, No. 23 Brock Deatherage, No. 24 Anthony Castro and No. 26 Gregory Soto.